A resource like no other. ProgramLive is a Multimedia, Java-Based "livetext" on Programming. 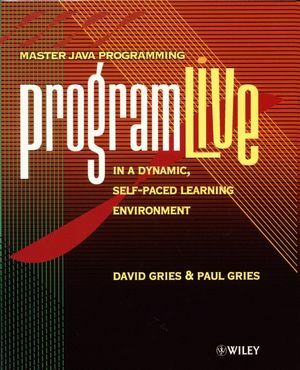 Combining animation, graphics, hypertext, and narration, ProgramLive provides hands-on instruction in Java and object-oriented programming, tutorials on the major IDEs, and access to many sample Java programs. Your students control the pace as they work through more than 300 activities, 500 minutes of high-quality recorded audio, and 70 hours of instruction. In addition, the ProgramLive CD is complemented by the programLive Companion. The Companion is a 300 page text that facilitates practice and structured note taking. The Companion also contains a comprehensive list of API specifications, making it an invaluable resource to students who want to get into the depths of the Java language. David Gries is an American computer scientist at Cornell University, United States primarily known for his books, The Science of Programming and A Logical Approach to Discrete Math. He is currently Associate Dean for Undergraduate Programs in the College of Engineering. Paul Gries has been teaching in the Department of Computer Science at the University of Toronto for more than 15 years. During his time at UofT, Paul has won numerous teaching awards, including UofT's most prestigious teaching award and an Ontario-wide teaching award. Read a review of ProgramLive in the University of Georgia's Columns: Campus News (http://www.uga.edu/columns/001106/campnews1.html). Each individual concept or method is explained, visualized (usually with interactive hands-on animation), demonstrated, and reinforced with a review, simulation, or exercise. Learning pace is under the learner's control. You can pause any activity, repeat any section, or repeat the entire activity as often as you wish. Extensive navigation aides keep you oriented within the course. You always know what you have already covered, what you are currently learning, and what you are about to cover. Many lessons employ discovery learning. You discover concepts for yourself by working with an appropriately designed visualization or simulation tool. Concepts discovered yourself are much easier to recall and to integrate with what you already understand. Most activities use several communication channels to convey ideas. Narration is synchronized with the animated appearance of words and formulas or movement by a visualization tool. For those who prefer to read and for those for whom English is not a primary language, all narration is available (optionally) on screen and can also be printed for future use when not around a computer. ProgramLive runs on Mac (7.5 and better) and Windows (95/98/00/NT) Operating Systems. It requires a computer with a 2X CD drive or better, at least 16 MB of RAM, and a sound card. It also requires a monitor that supports at least 256 colors and at least 800 x 600 resolution.